Your website can be an incredible tool to grow your business. But only if the content on your site is optimized to perform that way. One of the best ways to optimize your website is to conduct a content audit of the existing, indexable URLs. 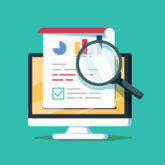 Discover website content audit basics, how the process works, simple ways to improve low-performing content, and even a free audit tool you can use today. The data you collect should help you figure out what to do with each piece of content on your website. The three basic actions will be to either keep a piece of content as-is, keep the content but work to improve it, or remove the URL entirely by deleting or consolidating that content into another page. Make sure any URLs you decide to remove are not major drivers of organic traffic. If you remove too much content without proper analysis, you run the risk of tanking your organic search rankings. Once you’ve decided what to do with each piece of content, you’ll need to create a plan to implement those changes. Start by removing the content that is harmful to your site rankings. Then focus on rewriting and redesigning the pages that need improvements, starting with the highest-priority pages. Remember that you shouldn’t just do one content audit and call it quits. This should be an on-going strategy to ensure your website is always at optimum performance. Here are some proven methods to improve the existing content on your website for both SEO and UX. If your business is a located in a specific geographic area, is your content optimized to appeal to prospective customers within that area? Add location keywords to drive organic search. But also consider how you’re framing your content. What are people looking for in your area in particular? For example, outdoor sporting goods stores in Alaska and Florida are going to be selling very different outdoor adventures. Car dealerships in a large city will have different selling propositions than dealerships in a rural area. Get more tips on creating an effective content strategy here. Always write and design your content with the end user in mind. We see many businesses construct their website content in a way that makes sense to them, but not necessarily their target audience. Remove terminology and jargon that your prospective customer may not know. At its core, every piece of content should answer the visitor’s core questions – and then direct them to the next step using a CTA. Have you ever been on a website that makes it incredibly difficult to find what you need? This is because their content doesn’t contain an intuitive, internal link structure. When you dive into a website’s content, it should be simple to find related information, go back to where you started, or continue on in the buying cycle. Here are 9 best practices to improve your overall website navigation. If the idea of a full content audit is overwhelming, start here. Our initial website audit will scan your site and help you understand how to maximize its potential.